You can modify properties by layer instead of individually. You can easily change the properties of a group of related objects that you place on one layer. You simply change the properties for the layer, not for a bunch of separate objects. In the worst-case scenario, you receive an architectural drawing from someone else, and everything looks good — even all the object colors are correct. You want to plot the drawing with no dimensions showing, so you freeze the Dimension layer. Oh, poo! (Or words to that effect.) Only half the dimensions disappear, but so do some center lines, a couple of walls, the toilet, and other items. If you assign properties with the ByLayer approach, all you have to do is set layer properties in the Layer Properties Manager palette. Use layer properties to control object properties. Before you draw any objects, verify that the Color Control, Linetype Control, and Lineweight Control drop-down lists — and the Transparency button in the Properties panel on the Home tab of the Ribbon — are all set to ByLayer. Remember that the configuration of panels and drop-down lists may vary according to the resolution of the display. If the drawing is set to use color-based plot styles rather than named plot styles, the Plot Style Control drop-down list is inactive and displays ByColor. ByLayer (nearly) all the way. 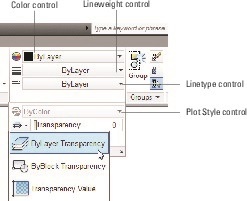 If the drawing is set to use named plot styles rather than color-based plot styles, the Plot Style control drop-down list should also display ByLayer. Don’t choose a specific color, linetype, lineweight, transparency, or plot style from the appropriate drop-down list in the Properties panel on the Home tab of the Ribbon, or from the Properties palette, and then draw the objects. All new objects will be on the current layer but will have property overrides applied. Don’t draw the objects, select them, and then choose a property from the same drop-down lists. If you prefer to do things the right way, assign these properties ByLayer. If you want to become a good CAD manager, learn how to edit the Customizable User Interface (CUI) file in AutoCAD, and then delete the property override items from the Ribbon. The SETBYLAYER command in AutoCAD lets you correct non-ByLayer properties. On the Home tab of the Ribbon, click the Modify panel label to open the panel slideout, and then click Set to ByLayer. Answer the prompts at the command line to finish modifying objects. For more information, refer to SETBYLAYER in the online Help system.